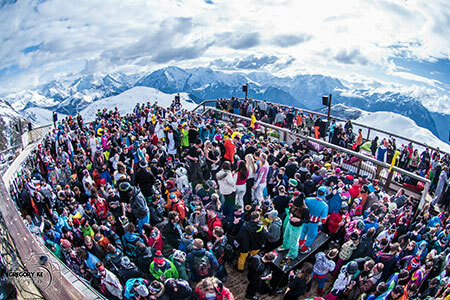 For a week of sunny skiing in France plus a completely unique music festival experience, Snowboxx is top of the list. Moving on from Alpe d’Huez, Snowboxx’s new home for 2016 was Avoriaz, the highest ski village in the Portes du Soleil ski area. The extensive range of ski in – ski out accommodations, vast ski area and excellent bars and après venues make Avoriaz an outstanding home to one of Europe’s most exciting snow festivals. The Portes du Soleil ski area stretches over 15 resorts and 2 countries and boasts 650km of ski runs. Due to its high altitude village and ski slopes, Avoriaz is known as one of the most snow-sure ski resorts in France making it a fantastic ski destination throughout the whole season. With live freestyle displays, winter markets, ice sculptures, pool parties and an incredible line up of international DJS across open air stages, Snowboxx provides you with a complete winter festival experience like no other. With a week-long of full on party action, après ski gets cooler than ice cold when Snowboxx comes to town, expect to dance from sunset to sunrise in the mountains, on the terrace and literally anywhere the music takes you. Save your voice for a unique karaoke experience in the sky and feel the heat at an impromptu tropical tea party, Snowboxx has it all and more. Traveling by plane and car is very easy to Avoriaz. Geneva airport is just 1h 45mins away and the drive to Avoriaz takes about 7 hours from Calais.